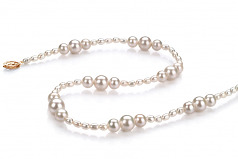 Solid white and varying in sizes gives life and value to these freshwater pearls. The patterned setups of the AA mirror like luster glimmering white pear with the larger pearls making up the centers of the patterns followed by the smaller scaled pearls offers a sense of sophistication rarely seen in this quality of pearls. Easily given as a gift to that special some, bridesmaids or even to the up and coming ladies, this is a set that you can’t go wrong with.